This topic is intended to address a specific issue called out by the Exchange Server Analyzer Tool. The site-wide public folder database for administrative group ’Exchange Administrative Group (FYDIBOHF23SPDLT)’ has been deleted. Current public folder store: ’CN=Public Folder\0ADEL:7b0fc218-05b2-4eae-9660-bbdd01f7e395,CN=Deleted Objects,CN=Configuration,DC=uw,DC=lu,DC=se’. The siteFolderServer attribute represents the Distinguished Name (DN) of the Public Folder store that is responsible for hosting the site folders (normally the first server in the site or administrative group). By default, the Site Folder Server is the first server that is installed in the administrative group. The public folder store on this server is the default location of the free/busy folders and offline address book folders for the administrative group. If you remove or decommission this server without replicating these folders to another server and designating that server as the offline address book server, Microsoft Office Outlook® 2003 users will see problems with the offline address book and with free/busy data. If you incorrectly modify the attributes of Active Directory objects when you use Active Directory Service Interfaces (ADSI) Edit, the LDP (ldp.exe) tool, or another Lightweight Directory Access Protocol (LDAP) version 3 client, you may cause serious problems. These problems may require that you reinstall Microsoft Windows Server™ 2003, Exchange Server 2003, or both. Modify Active Directory object attributes at your own risk. Open an Active Directory editor, such as ADSI Edit. In the right pane, right-click CN=<PublicFolderStoreName>, and then click Properties. In the Attributes field, scroll down and select the distinguishedName attribute. Click Edit, and then copy the entire attribute to the Clipboard. Right-click the administrative group you want to modify, and then click Properties. In the Attributes field, scroll down and select the siteFolderServer attribute. Click Edit, and then paste the value for the distinguishedName attribute into the Value field. Double-check the contents of the Value field to ensure the paste was performed correctly, and then click OK to save the change. Click OK to close the Administrative Group properties. Exit the Active Directory editor and restart the Microsoft Exchange Server Information Store service on all Exchange Server computers in the site for the change to take effect. 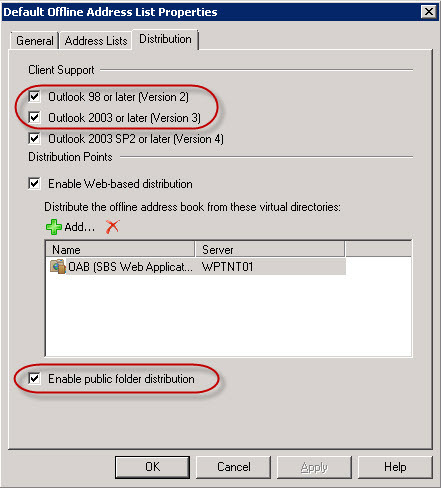 In a migration environment with exchange 2007 and exchange 2010 we have client (outlook 2007) that hangs 10 seconds when sending a meeting that books a resource mailbox residing on Exchange 2010 mailbox server. In a support case to microsoft they acknowledge this problem as a feature in exchange 2010 when booking resourcemailboxes. They state that this is a fix (code release) for office 365 (clod exchange) where microsoft is not using public folders. This fix is for Outlook 2003 clients when connection to the clod. Outlook 2003 use public folder for accessing free/busy information and when microsoft closed this door in office 365 they had to get a workaround for outlook 2003 users. 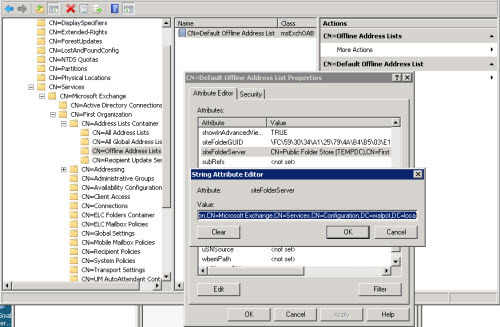 This fix is intercepting outlook 2003 calls to public folder on a mailbox server and redirecting them to webservices (EWS) on a CAS on behalf off mailuser. Outlook 2010 is not affected like outlook 2007. This is not a correct picture yet. A better one is coming soon. 2. Mailbox server trying to access https://webmail.org.se/EWS/Exchange.aspx for free/busy information behalf off mailuser insted of accessing public folder. 4. CAS answering mailboxservers request for information. It is a fix release for both clod and on premise. So it is affection or local environment to and that is bad! Well, we can not access Internal URL for EWS from our mailboxservers. But our network design is not letting us do this right now. When we worked around this problem we no longer have a problem with outlook 2007. So thats good! But this proxy fix for outlook 2003 in the clod is still affecting outlook 2007 even thou we no longer see a problem. Microsoft is releasing a option in Exchange 2010 SP1 RU4. You will have a way to disable the Availability intercept by using the following registry value.